Lisa Belcastro with not the biggest fish but her first of the season. Her smile says it all. Janet finally gets more than just a bump. "I wanted to keep it but let it swim away," she said. OK, what’s going on? I don’t mean to panic, but I have been searching for fish and talking to fishermen all over this Island and on the Cape. We all agree there are very few fish around, especially bluefish. The M.V. Surfcasters finally posted some big shore bluefish. 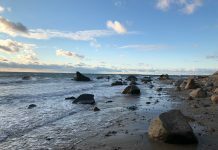 Most were caught in the rip at Wasque on Chappaquiddick. All the fish were weighed in on the same day. John Piekos, Ron Domurat, Peter Sliwkowski, and Phil Horton hit big fish on July 21. Phil is in the lead with a 13.7-pounder. Unless you live on Chappy, it can be an expensive journey to fish there daily. I wasn’t there that day. There is still only one striped bass weighed in for the month. I was up to Menemsha the other day, a decent tide, nice day, but noticed an empty jetty. I talked to Carsten Larsen as he sat in front of his sushi shack selling yellowfin tuna. Tuna fishing is happening, but bass and blue fishing is slow from the shore. Scott McDowell had a successful morning with some nice keeper striped bass, but he agreed, the fishing is slow this season, and the bluefish are scarce. His partner of nine years, Annette Cingle, and her daughter Anna Lee stopped for a chat as they drove down Dutcher’s Dock. Annette is usually busy taking charters out on her boat, the Anna Lee, but said it’s too difficult to find fish right now. She is an expert fisherman, but her boat is not as large as some of the other charter captains, so she is limited to fishing closer to shore. I was fishing the north shore with my friend Lisa Belcastro. The sun was going down and we walked by Luke Brewer bait-fishing with some of his friends. It filled our hearts to see these young folk enjoying the sunset in one another’s company while fishing. Island life at its best. When we returned from our long walk searching for striped bass, Luke had a six-pound bluefish lying on the beach. He said he had not kept a bluefish all year, and was excited to take this one for the table. One stray bluefish. 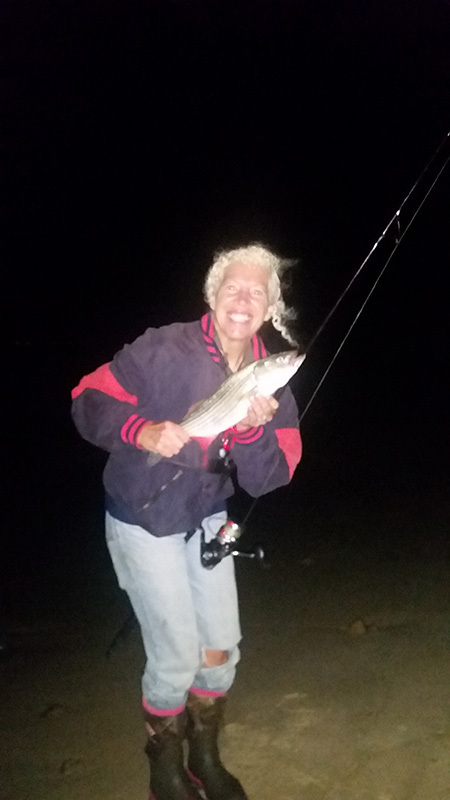 I don’t know if they caught anything more that evening, but I finally got a striper at the exact spot I began walking and casting, two hours earlier. 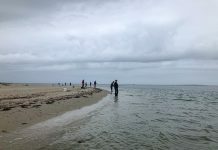 I know they are getting large striped bass in the canal on Cape Cod, and many of the young striped bass hunters are taking the trip off-Island to fish for them. Thirty-, 40- and 50-pound fish, even in the middle of the day. 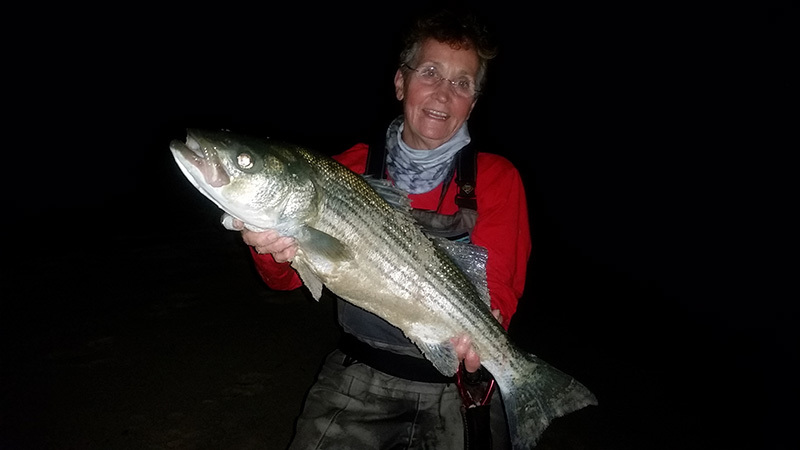 When large stripers hit the canal, it was reported that some fishermen were harvesting more than allowed. The Environmental Police, EP, have fined fishermen that just cannot seem to obey the Massachusetts law, one fish per angler per day. The poachers were fined, and their fishing gear taken away. The decline of the striped bass is already a concern, and a handful of poachers can do a lot of harm to their recovery. The Massachusetts EP appreciates the citizens who exhibit stewardship and report wrongdoings. Conservation of the environment is everyone’s responsibility. I don’t want to push the alarm button, because I have fished for more than 40 years, and have seen that many species are cyclical. They become abundant and then they decline. When I had first started my fish taxidermy business, I donated a mount to the MV Derby Kids’ Day tournament. I offered to do the largest scup. That was in 1988. A few years later, it seemed that the smaller kids were more successful catching sea robins, so I thought I would do a sea robin instead. Sea robins had always been plentiful. 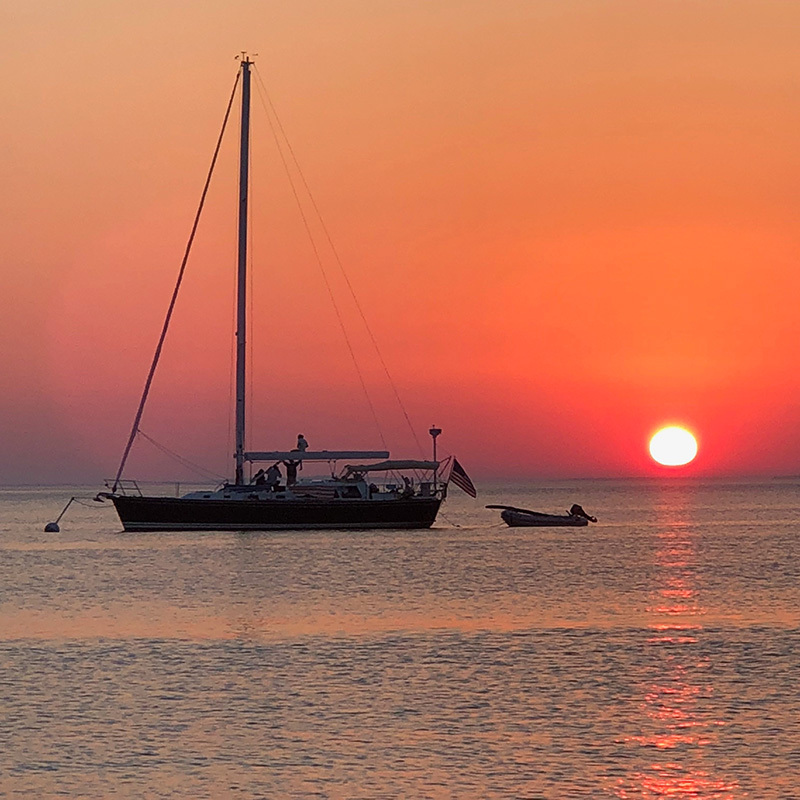 Believe it or not, for the next decade, not one sea robin was caught, and at least 250 children were fishing the Kids’ Day each year. Now they have returned. Lately sea robins are entertaining Chappy fishermen, bumping lead heads on the bottom for striped bass and ending up with a huge sea robin. These prehistoric bony-headed fish might be difficult to fillet because of the sharp points protruding from their heads, but they are tasty. The back on each side of the spine yields a solid white chunk of fish sometimes called “poor man’s lobster.” So if you catch one of those big ones, you might want to have it for dinner. I caught my first black sea bass in the late ’70s. I had only been fishing a few years at that time. I was on the end of West Chop jetty. I never saw another one until about 10 years ago. That’s over 30 years! They are plentiful once again, and one of the best-eating fish. Weakfish, also called squeteague or sea trout, were also abundant when I started fishing. I would go to Lobsterville with a Boone’s needlefish and catch many weakfish, weighing from four to eight pounds. I’ll never forget the first one I caught while I was fishing for striped bass with my mentor, Jack Coutinho. I could not believe how beautiful it looked under my light at night. Pink and purple and every other color of iridescence glimmering from its scales. They were also delicious. But then, around 1989, they seemed to disappear. They were in the Derby prize structure in the early ’80s for six years, but when none were caught, once again they were removed in 1987. I hear they are abundant in Rhode Island, but they don’t seem to make it into our waters around the Vineyard. Back to bluefish. There is a story told that someone caught one back in the 1940s and they were so scarce that they didn’t know what it was, and had to take it to a tackle shop to get it identified. 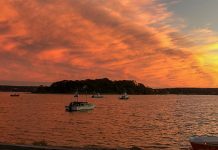 In the 1970s, when I got hooked on fishing the surf, they were so abundant that we sometimes thought they were a nuisance, especially while fishing for striped bass. These huge toothy critters can do a lot of damage to your fishing line and lures. Thinking that the bluefish could be scarce was hard to believe. Maybe they are on a down cycle. Squid — I stopped by Coop’s on July 26, a week ago. His sign read, “Fresh Island Squid.” Great news. Get your squid jigs ready and stock up. The Derby is only seven weeks away. Sad news — Richard Berkley, M.V. Surfcaster member and onetime president of the Roccus Partners fishing club in New York, has taken ill. He is in a hospital in Boston, and we send our prayers and healing thoughts to him. If you want to send a card or note, it’s Richard Berkley, P.O. Box 1861, Edgartown MA, 02539. His family is checking frequently, and will make sure he gets any messages.